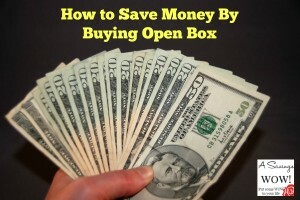 Open Box Items | A Savings WOW! My family and I have saved a lot of money over the years by buying open box, display, and refurbished items. Laura Harders of Beltway Bargain Mom included some of tips on how to save when shopping for those in her article for the U.S. News and World Reports Money – “Think Outside the Box by Buying ‘Open Box’.” Check it out and let me know if you’ve ever saved money buying open box, display, and refurbished items or if that is something you plan to do now that you have the tools!